Looking at metals prices this week, gold moved lower, with spot prices currently at $1307.80/ounce, down $25.46 (-1.9%) compared to $1333.26 on 07/26. Silver is currently trading at $19.83/ounce, down $0.17 (-0.9%) from $20.00 on 07/26. And turning to copper, the current spot price of $3.17/pound, has copper up $0.06 from $3.11 on 07/26, a week over week gain of +1.9%. The Steel ETF (SLX) outperformed other Metals ETFs this week, down about 0.1%. Components of that ETF showing particular strength this week include shares of Carpenter Technology (CRS), up about 10% and shares of A&M Castle (CAS), up about 7.4% on the week. And underperforming other Metals ETFs this week is the Junior Gold Miners ETF (GDXJ), off about 8.4% this week. Among components of that ETF with the weakest showing for the week were shares of Crocodile Gold (CRK.CA), lower by about 25%, and shares of Banro (BAA.CA), lower by about 17.8% on the week. Other ETF standouts this week include the SPDR S&P Metals and Mining ETF (XME), lower by about 2.6% but still outperforming other ETFs for the week. And the Gold Miners ETF (GDX) was an underperformer, falling about 7% this week. 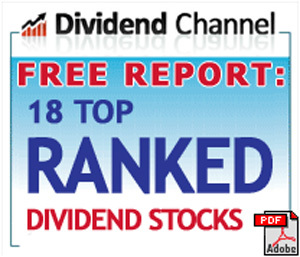 At sister site Dividend Channel, we screen through our coverage universe of dividend paying stocks each week, and we look at a variety of data — dividend yield, book value, quarterly earnings — and compare it to the stock’s trading data to come up with certain calculations about profitability and about the stock’s valuation (whether we think it looks ”cheap” or ”expensive”). History has shown that the bulk of the stock market’s returns are delivered by dividends, and so we pay special attention to dividend history. And of course, only consistently profitable companies can afford to keep paying dividends, so profitability is of critical importance. Dividend investors should be most interested in researching the strongest most profitable companies, that also happen to be trading at an attractive valuation — maybe there is a company-specific reason causing the stock to be ”cheap” or maybe the entire sector is taking a hit, but whatever the reason, we think there is great value in ranking the Metals Channel coverage universe weekly using our proprietary DividendRank formula, and sharing the list of the week’s top ranked metals stocks with our subscribers. These are the metals stocks our DividendRank system has identified as the top most ”interesting” in the Metals and Mining category … this is meant purely as a research tool to generate ideas that merit further research. The Retiree Income Portfolio is geared for the individual in retirement or approaching retirement. It is designed to be a portfolio that needs minimal attention and rebalancing. It has a heavy focus on income and dividends, especially monthly and quarterly income. Find out exactly what the portfolio is holding today with a free 30 day trial! Looking at metals prices this week, gold moved higher, with spot prices currently at $1477.10/ounce, up $70.80 (+5.0%) compared to $1406.30 on 04/19. Silver is currently trading at $24.41/ounce, up $1.12 (+4.8%) from $23.29 on 04/19. And turning to copper, the current spot price of $3.22/pound, has copper up $0.07 from $3.15 on 04/19, a week over week gain of +2.2%. The Silver Miners ETF (SIL) outperformed other Metals ETFs this week, up about 7.5%. Components of that ETF showing particular strength this week include shares of Aurcana (AUN.CA), up about 24.4% and shares of Golden Minerals (AUMN), up about 14.6% on the week. And underperforming other Metals ETFs this week is the Steel ETF (SLX), up about 3% this week. Among components of that ETF with the weakest showing for the week were shares of Carpenter Technology (CRS), lower by about 3.6%, and shares of Reliance Steel (RS), lower by about 3.5% on the week. Other ETF standouts this week include the Junior Gold Miners ETF (GDXJ), outperforming this week with a 6.7% gain. And the SPDR S&P Metals and Mining ETF (XME) was an underperformer, up just 3.4% for the week. A management service designed to manage the risk of the stock market on a daily basis. The service is designed to profit from both rising and falling markets via the use of easy-to-trade ETFs. Each and every day we answer the age-old question of should I be “long” the market, “short” the market or “out” of the market. We want to be fully invested in stock market when equities are rising and we want to be either short the market or in cash when equities are falling.